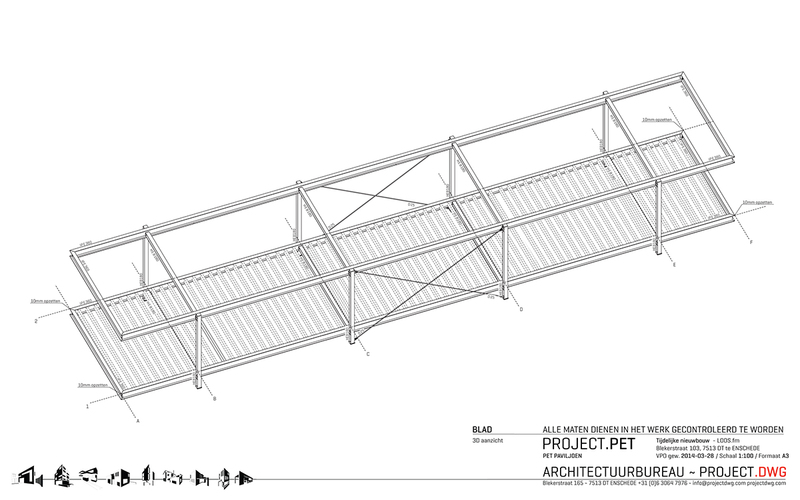 The PET pavilion is a temporary structure, used as a public space in a shared community park. The architecture informs on topics including sustainable building, recycling and waste-cycles by rethinking the way buildings are developed, built and used. 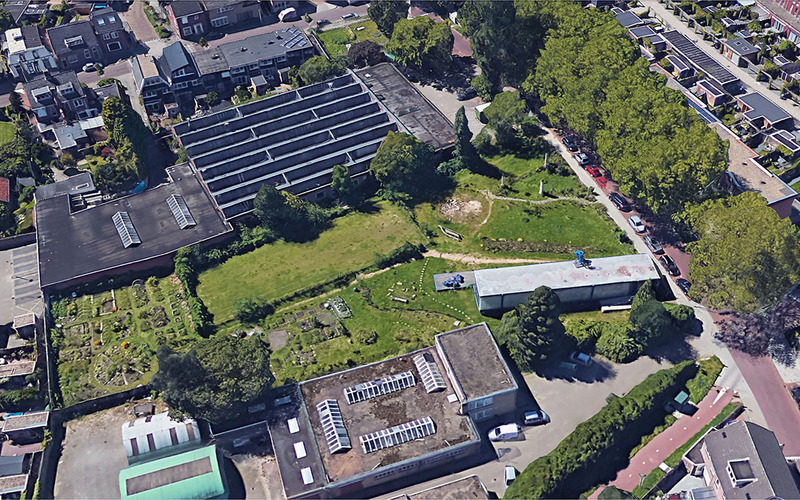 The temporary park where the pavilion is situated comprises of the former Robson pajamas factory (now a creative hub for young professionals), a large dog training field, 50 allotment gardens, and a neighborhood park maintained by the community. 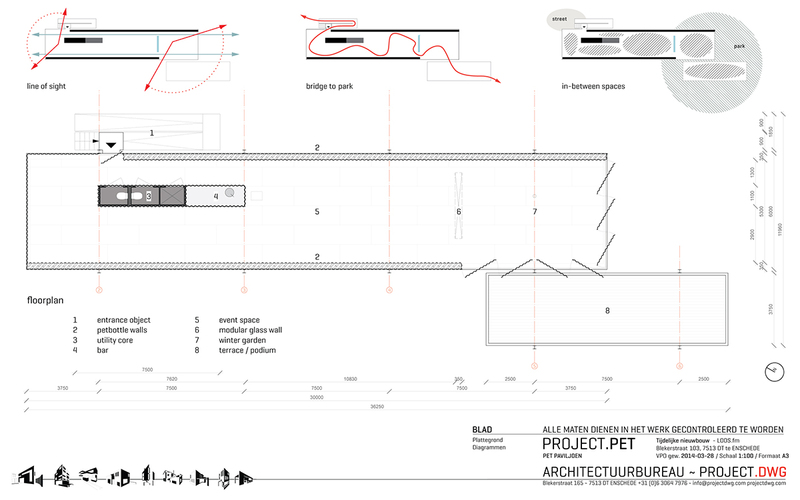 Here the PET pavilion plays a central role as a public living room for the local community. In only four years, the Robson Park transformed from a former wasteland to central meeting space. The program in the PET pavilion ranges from children playing and learning in allotment gardens, to meetings of the neighborhood council. Major art exhibitions alternate through big festive events, all the while the PET pavilion is sub-rented for conferences, meetings and activities. 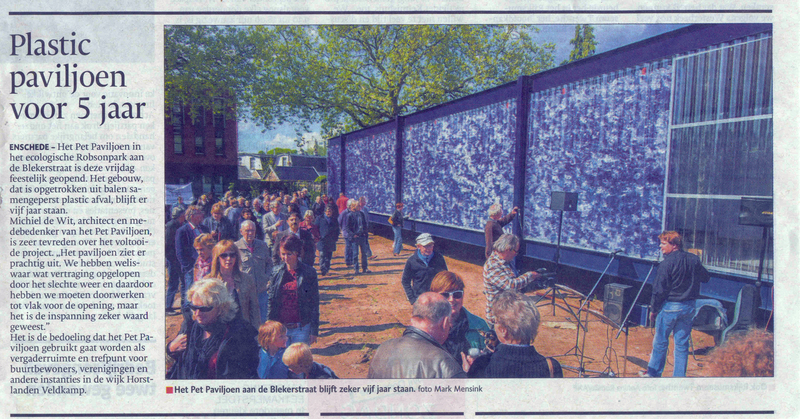 Temporary public space developed on derelict land is a phenomenon called ‘pauzelandschap’ in the Netherlands. Which translates as a welcome solution to postponed or abandoned developments planned for an area. By providing an urban area with additional program and amenities, complementary to the context, interventions as such can ‘temporarily’ (weeks to years) overcome the problem of vacancy with broad support of the community. Since the building crisis, further area development in the neighborhood came entirely to a halt. The derelict plot near the factory attracted shady activities and was often used to illegally dump bulky waste. For children, no safe place to play. The neighborhood organized themselves and developed together with LOOS.fm and the housing corporation a widely supported project to overcome the development stop and that was also significant to the social environment. Since there were talks of managing the pavilion as well, LOOS.fm ultimately became it’s own client. Which, in favor of the concept, made ad hoc decisions possible in the process and implementation. Co-developing the project with the community and managing the pavilion has been a most educating experience, changing our views on architecture and shared space for the better. What began as an idea for a cardboard pavilion, soon developed into a study to use plastic waste as building material. Stacking the bales of plastic waste (as found at a recycling plant) would have resulted in nothing more than a large structure made out of waste. 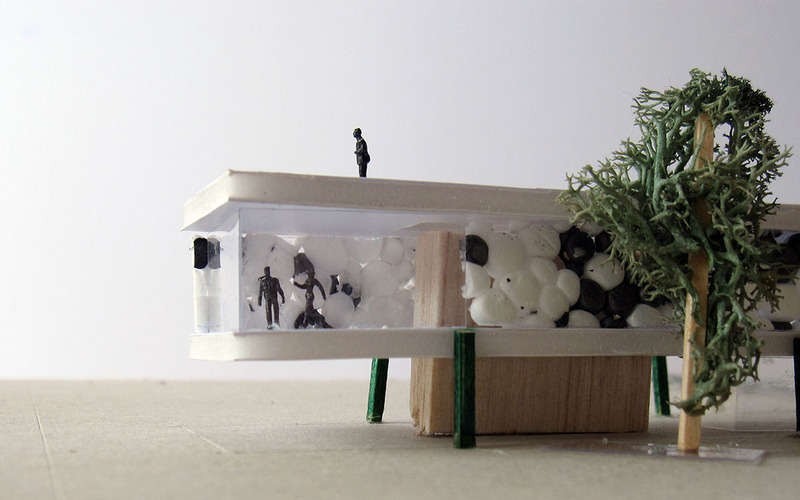 Clearly, an architectural concept was needed to turn waste into architecture. The elevated framework of the Farnsworth House (by Ludwig Mies van der Rohe) turned out to be the perfect reference to make that happen. This resulted in two monumental slabs, which have the appearance of luminous transparent curtains, embedded in a steel framework. 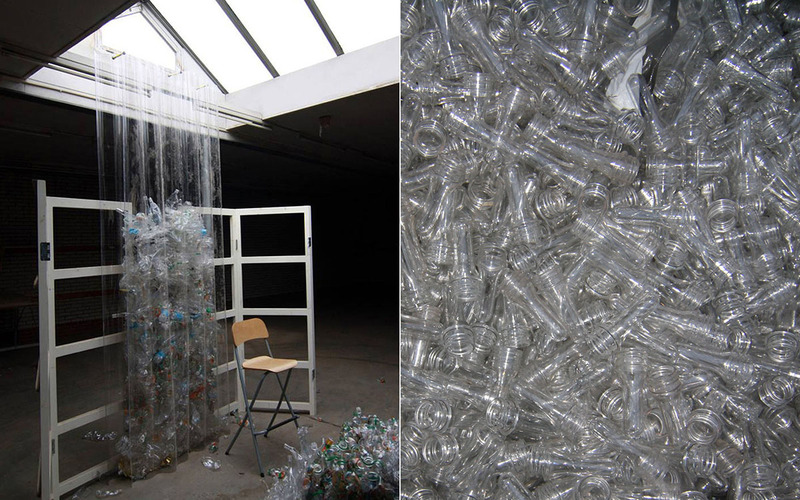 From floor to ceiling, double-walled transparent corrugated sheets hold over 40.000 empty plastic bottles. Coincidentally the bottle caps on the mounted bottlenecks holding the walls together, make an amusing reference to the tie points of a thousand times more heavier concrete wall. During daytime, the translucent mass of crumpled shapes illuminates the interior. By night, the massive ‘curtains’ turn into an abstract lantern in the landscape. Near the street and covered in 25.000 bottle caps, an object combining the staircase and ramp, gives entrance to the elevated pavilion. Covered in 8,000 empty tubes of body wash, a facility core divides the space seamless into the different areas surrounding the core. In the fall, a volume of reclaimed glass panels creates a winter garden on the sunny side of the pavilion. Here seven large pivoting doors open the entire corner of the building towards the park. Visitors to the pavilion experience the spaces as thresholds, which build up to entering the park from within. Centrally located in the park, the terrace becomes a podium in the landscape. A favorite hangout at large events. Although sustainable building is an important theme in architecture, solutions are not always as green as they seem. For example, a seemingly sustainable product, could have a negative footprint through the production process. 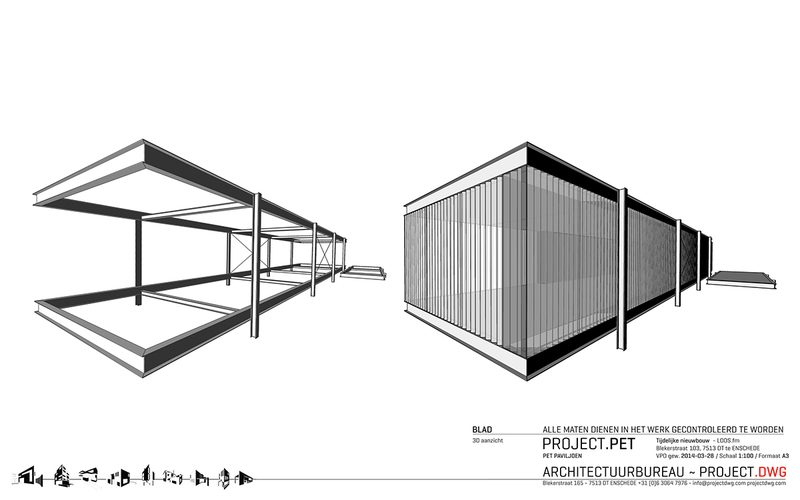 The PET pavilion holds no claims in being a sustainable solution though. It’s rather an experiment that explores new possibilities and creates awareness. The immense amount of PET bottles in the facades allow us to see the extent to which we are consuming products and producing waste. Every year, billions of kilograms in the Netherlands alone. Where does it all go? And more so: What else can we do with it?.. These are among the questions the PET pavilion raises, which attracts and wonders visitors. 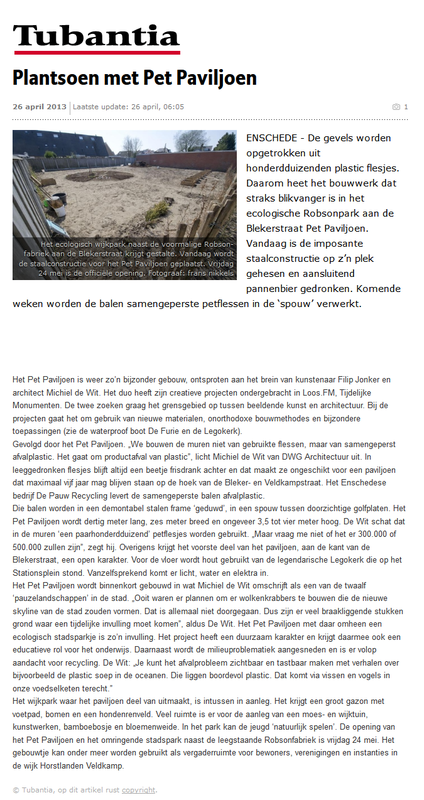 The PET pavilion shows that a temporary building can fully serve its purpose, before being reused or recycled, without losing material value. Possibly in an entirely different context, with a different purpose. 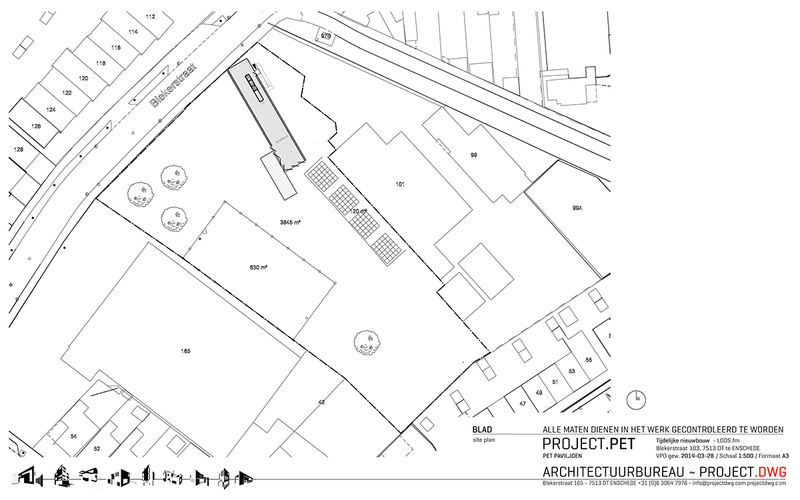 By the end of 2017, the PET pavilion will have a new destination, jet to be determined. 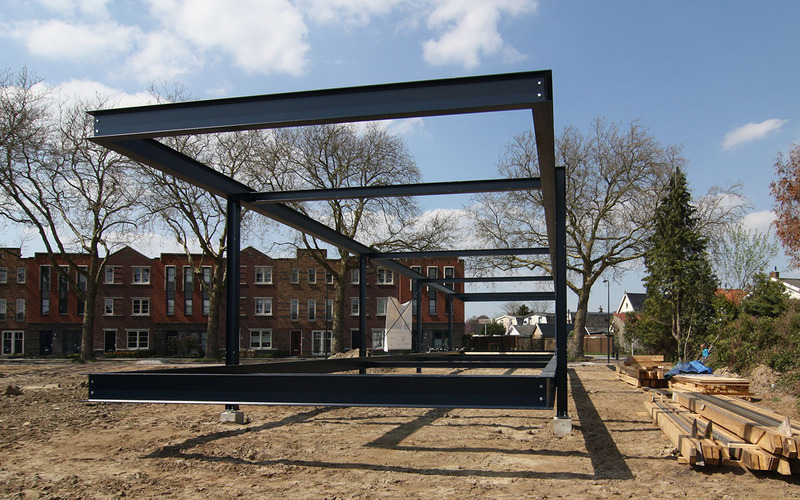 Within a day, the steel structure can be dismantled on site, ready to be transported to the next. 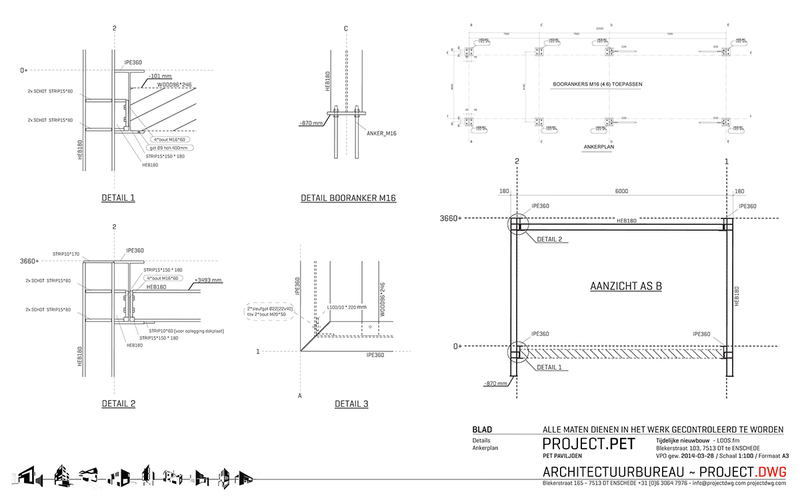 The future purpose will set the next challenge for a new appearance within the framework of the steel frame.